I highly suggest this movie! Since that day I have been wanting to watch some Roller Derby action live! This weekend I finally had that opportunity. 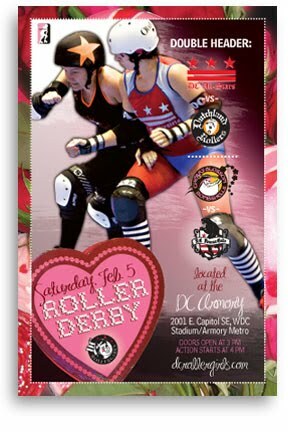 On Friday, my fabulous boyfriend let me know that the DC Roller Girls were having a Double Header showdown. We immediately made plans to attend the next day. Doors opened at 3pm and we arrived at the stadium at 2:55 sharp. It was already a mad house. The DC Roller Girls have huge following and with a concession stand, Jumbo beers, and a bake sale it was also a culinary dream! Sadly, the DC-All Stars were defeated in the final minutes, but they put up a great fight. After a very entertaining half time show put on by the Fairfax County Circus Club (I cannot put into words what this was like...think 2nd graders juggling and on unicycles), it was time for the next match featuring the Cherry Blossom Bombshells vs. the DC Demoncats. Josh and I left before the end of their game (a few too many libations), but it was clear that the DC Demoncats had the advantage. In conclusion, Roller Derby is AMAZING, and I will be attending the next event here in DC in March. I suggest that everyone get online and research their local derby girls and experience the live action themselves! *Foul Furious is my roller derby name. It is a derivative of Falfurrias, my hometown, and it is fitting because I am tough and will take those girls down. BUYAAAA! I loved Whip It! Ellen Page can do no wrong in my eyes, haha! Sounds like a fun day! I loved that movie too - it started my epic journey of trying to become a derby girl here in Oz. 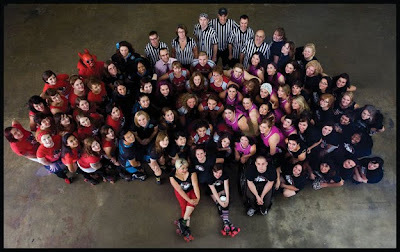 Roller Derby has been a positive force in so many women's lives - whether as a player, official or spectator. Welcome to the fun! I love it! I've always wanted to go to a Roller Derby! Playing would be another thing...not so sure the mental toughness actually comes out in my physical ability..